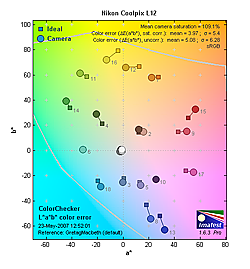 Most consumer digital cameras produce color that's more highly saturated (more intense) than found in the original subjects. This is simply because most people like their color a bit brighter than life. The Nikon Coolpix L12 produced good overall saturation, with only slight oversaturation in the strong reds, blues, and greens. Better than average results, in that the colors should be bright enough for most consumers, without offending those who prefer more accurate rendering. Where oversaturation is most problematic is on Caucasian skin tones, as it's very easy for these "memory colors" to be seen as too bright, too pink, too yellow, etc. Here, however, the L12 produced good results. The other important part of color rendition is hue accuracy. Hue is "what color" the color is. The L12 did push some reds a little toward orange, and oranges toward yellow, but overall color looked good and realistic. All in all, better than average color handling, surprising in a camera this inexpensive. Very good color balance with the Manual white balance option better than average with Auto, about average positive exposure compensation required. Color balance indoors under incandescent lighting was a little warm and pinkish in Auto white balance mode (better than most cameras manage though), and the Incandescent setting resulted in stronger yellow color balance. However, the Manual option produced nearly accurate results, if just slightly greenish. The Nikon Coolpix L12 required a +1.0 EV exposure compensation adjustment for a bright exposure, which is about average for this shot. Overall color looks pretty good, though the blue flowers came out purple. (Many digital cameras push the blue flowers toward a darker, more purple hue.) Our test lighting for this shot is a mixture of 60 and 100 watt household incandescent bulbs, a pretty yellow light source, but a very common one in typical home settings here in the US. The Nikon L12's Outdoor shots generally showed accurate exposure with pretty good highlights. Shadow detail was limited, with some visible noise suppression artifacts. Exposure accuracy overall was quite a bit better than average, the camera requiring less exposure compensation than we're accustomed to seeing with consumer digicams. High resolution, 1,300 ~ 1,400 lines of strong detail. Our laboratory resolution chart revealed sharp, distinct line patterns from the Nikon Coolpix L12 down to about 1,400 lines per picture width horizontally, and about 1,300 lines per picture height vertically, with extinction at around 1,600 - 1,700. Use these numbers to compare with other cameras of similar resolution, or use them to see just what higher resolution can mean in terms of potential detail. Beware that while you might be able to make out what looks like distinct lines at numbers higher than those we've mentioned here, the camera is just doing its best to continue interpreting the lines. Fairly sharp images, though some blurring of detail from noise suppression. Noise-suppression systems in digital cameras tend to flatten-out detail in areas of subtle contrast. The effects can often be seen in shots of human hair, where the individual strands are lost and an almost "watercolor" look appears. The crop at far right shows this, which shows lower detail than most, because the L12 chose ISO 400 for this shot. The Coolpix L12's automatically controlled ISO setting produced moderately high noise. The Nikon Coolpix L12 automatically adjusts the ISO sensitivity, anywhere from 50 to 1000, so we couldn't produce our usual table of results at different ISO settings. The shot above was taken at around ISO 400, and shows moderately high image noise, with somewhat soft fine detail. The resulting images were rather soft and a little noisy looking at 8x10 inches, but good at 5x7, excellent at 4x6. High resolution with pretty good overall detail, though limited shadow detail. Limited low-light capabilities. How bright is this? The one foot-candle light level that this test begins at roughly corresponds to the brightness of typical city street-lighting at night. Cameras performing well at that should be able to snap good-looking photos of street-lit scenes. A slightly weak flash, our standard shots required less than average positive exposure compensation. Flash coverage was uneven at wide angle, though much more uniform at telephoto. In the Indoor test, the Nikon Coolpix L12's flash underexposed our subject at its default setting, requiring a less than average +0.7 EV exposure compensation adjustment to get reasonably bright results. The camera's Slow-Sync flash mode also produced good results with +0.7 EV exposure compensation, though the background incandescent lighting results in a strong orange-yellow cast. There is no way to force the L12's ISO sensitivity to 100 for our standard flash range test, but as you can see, results are quite bright at 8 feet using ISO 95 at wide angle. Image brightness remains fairly constant as the camera boosts ISO to compensate for the added distance. At telephoto, the ISO 97 image taken at 7 feet is a bit dim, but again brightness does not fall off. 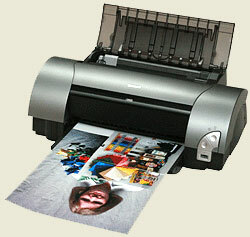 Good print quality, good color, very usable 11x14 inch prints. With the Nikon Coolpix L12, we found that it had enough resolution to make very crisp 8x10 inch prints. At 13x19 inches, its prints were softer, but probably adequate for wall or table display, though the softness in the corners of the frame does indeed show up at this size. High-ISO performance under dim lighting will be something of a turkey-shoot, as the fully automatic exposure system leaves you never knowing just what ISO setting the camera is going to choose. That said though, even its highest-ISO shots will make 4x6 inch prints that will be acceptable to many (if not most) users. The lighting for our "indoor portrait" test is somewhat brighter than you'll find in most residential interiors in the US, and at that level produced ISO 400 shots that looked quite good at 5x7 inches, but rough at 8x10. So give it as much light as you can, but expect 8x10 inch prints from indoor shots to be soft and noisy. If you can get by with 4x6 inch snapshot prints though, you'll probably be happy with shots captured by the L12 under almost any condition. Color-wise, the Nikon Coolpix L12's images looked great when printed on the Pro 9000, with bright, vibrant color that stopped short of being too bright. To our eyes, the Nikon L12 strikes just the right balance between color saturation and believability in its images. Very well done. The images above were taken from our standardized test shots. 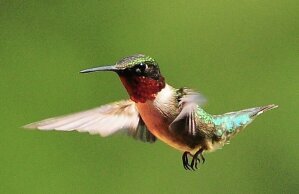 For a collection of more pictorial photos, see our Nikon Coolpix L12 Photo Gallery . Not sure which camera to buy? Let your eyes be the ultimate judge! Visit our Comparometer(tm) to compare images from the Nikon Coolpix L12 with those from other cameras you may be considering. The proof is in the pictures, so let your own eyes decide which you like best!